Top row, from left: Thomas Bernhardt, Edward Boyden, Dr. Benjamin Ebert. Bottom row, from left: Stephen Liberles, Beth Stevens, and Feng Zhang. Does Boston boast more brainiacs than anywhere else in the country? By one measure it does. The Howard Hughes Medical Institute, a nonprofit research organization, on Wednesday named 19 new medical investigators who will receive a total of $200 million to do whatever biomedical research they want. For the second time since 2013, roughly a third of the investigators were based in the Boston area, a greater concentration than any region in the country. The institute, which was started in 1953 by the business magnate, aviator, and maverick film tycoon whose name it bears, will provide each investigator with $8 million over seven years. The term can be renewed after a scientific review. Recipients were picked from 675 eligible applicants. 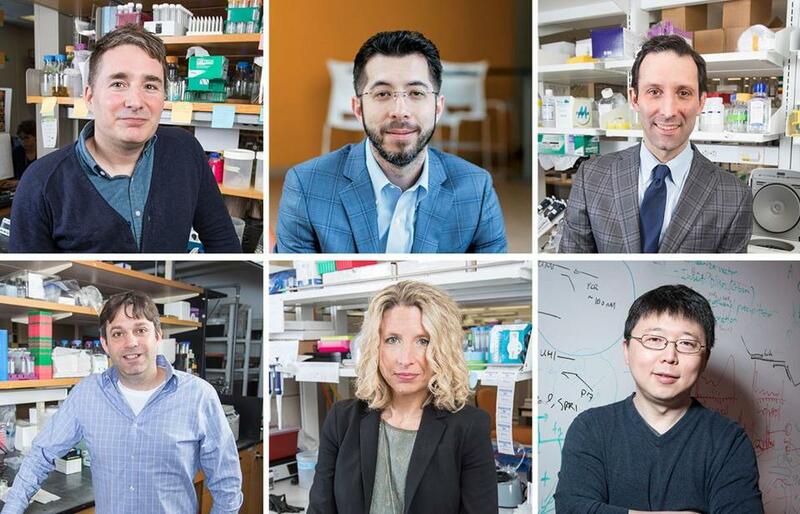 The six local investigators include microbiologist Thomas Bernhardt and cell biologist Stephen Liberles, both of Harvard Medical School; neuroscientist Edward Boyden of the Massachusetts Institute of Technology; Dr. Benjamin Ebert, an oncologist at Dana-Farber Cancer Institute; neuroscientist Beth Stevens of Boston Children’s Hospital; and Feng Zhang, a biochemist at MIT who helped pioneer the CRISPR gene editing technology. Their research interests range from how to combat antibiotic resistance (Bernhardt) to cancer-causing mutations in blood cells that also predispose people to heart disease (Ebert), according to the institute. Twenty-eight current or former HHMI scientists have won a Nobel Prize. Investigators have made leaps forward in HIV vaccine development, microbiome and circadian rhythm research, immunotherapy, and the genome editing tool known as CRISPR/Cas9, among other fields. The institute names a new cadre of investigators roughly every three years. In 2013, nine of the 27 recipients were from Massachusetts, also more than from any other part of the country. Because the funding has no strings attached, HHMI investigators are free to pursue their wildest scientific ideas. They don’t have to write grants and wait months to hear if they’ve won approval. The money can be used partly to pay laboratory staff who help investigators, as well as other expenses. Longtime HHMI investigators in the Boston area include Michael Rosbash, chair of neuroscience at Brandeis University and a Nobel laureate (an investigator since 1989), and Christine Seidman, director of the cardiovascular genetics center at Brigham and Women’s Hospital (an investigator since 1994), according to the institute. Dr. George Q. Daley was an investigator from 2008 to 2017, when he resigned to become dean of Harvard Medical School.